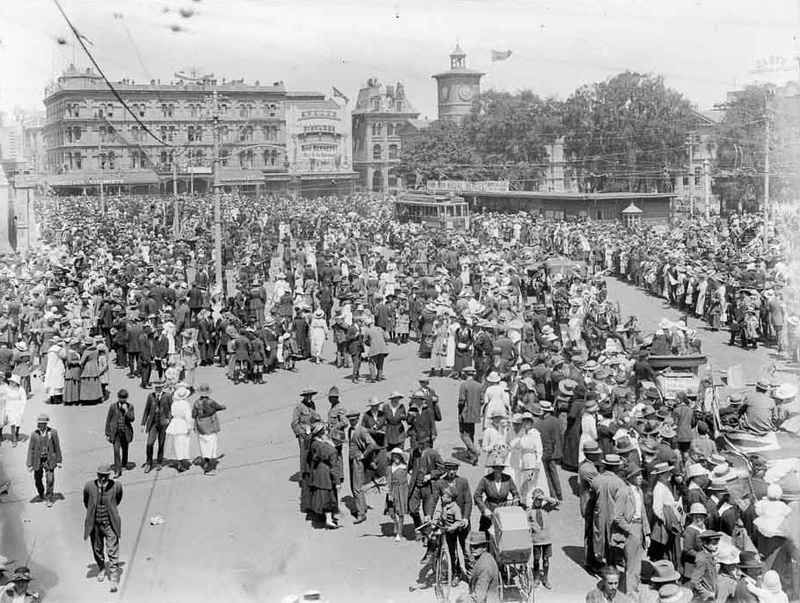 In 1918, after four years of slaughter, deprivation and hardship, the Central Powers of Austro-Hungary and Germany were rocked by strikes and mutinies. In February, a naval mutiny broke out at Kotor and sailors shot their officers; by October, the Austro-Hungarian army had collapsed from mass desertions and political upheaval. Soon afterwards a mutiny by German sailors at Kiel merged with other uprisings and quickly escalated into a full-scale rebellion against the imperial state, sparking the abdication of the German Kaiser and the proclamation of a workers’ republic on 9 November 1918. Preferring peace to full-scale revolution, an armistice with the Allied powers was signed two days later, on 11 November 1918. Working-class revolt had helped to end the First World War. Not that you’d know this from New Zealand’s centennial commemoration of armistice Day, Armistice 100. People across the country will take part in a number of sanitised official events, from joining the ‘roaring chorus’ to texting the Armistice Beacon. They’re unlikely to learn much about the strikes, mutinies and resistance from below that toppled both generals and governments. I’ve searched the program resources in vain for any reference to how and why armistice came about. Among messages of peace and the standard script of sacrifice and loss, there is a notable silence when it comes to the masses of working men and women who contributed to the war’s end. Instead, peace seems to fall upon the war like a happy sun-shower. The surrenders of the various Central Powers seem to just … happen. Why is there such a gap in the historical narrative? Surely it is not for lack of time or information. We’ve had four years of commemoration and some big spends to go with them (although not as much as Australia, whose $1.1bn dwarfs the $31m spent in New Zealand). It’s not as if the date crept up on us. Perhaps I’m being far too critical of the Armistice 100 program and the small pool of public historians working on WW100-related events. After all, I’ve been one of them, although if I’m honest, the feature on censorship and its marginal references to dissent during the First World War was possibly too little, too late. It would be wrong to see this glaring omission as some devilish scheme designed to serve the interests of capital and the state. There’s no conspiracy at play here. Instead, official historians are often hamstrung by codes of conduct and the mythical stance of neutrality, or by what is or isn’t palatable to their managers and their manager’s managers. Histories of social revolution, radical ideas, and the agency of everyday, working-class people are hardly the thing of monthly reports or ministerial press releases. And despite the big-ticket items of commemoration, the long, hard slog of quality, in-depth research is like the work of any modern workplace – of trying to do more with less. Yet if we centre class, and class conflict, in our reading of armistice, the history it reveals is somewhat different to the official account on offer. A few examples will suffice. On 16 October 1918, 14 men of the 1 New Zealand (Divisional) Employment Company were charged with mutiny after ‘combining together not to work in the NZ DIV laundry when it was their duty to do so.’ The men, most of whom were labourers, were all sentenced to six months imprisonment with hard labour for their collective work-refusal. That their sentences were later remitted does not negate their struggle. Observed William Wilson, a farmer: ‘Codford [Camp] the last few weeks has been unbearable, discipline has gone to the pack and the troops don’t care a damn for officers and NCOs.’ Strikes by British dockers and seamen caused further delays, and further examples of direct action. There was conflict in Bulford and Sling camps, where New Zealand troops were charged with ‘endeavouring to persuade persons to mutiny’ and sentenced to hard labour. And on the transport ships home, unpopular officers found themselves victim to collective justice. In these moments, when the soldiers took power into their own hands, the generals were powerless to act. Back in New Zealand, the sudden end to the war, coupled with the influenza pandemic, also tested the home front military command and their ability to enforce discipline. Two weeks after armistice, the Chief of General Staff, Colonel Charles Gibbon, found himself rushing to Featherston Military Camp, where the troops were mutinous. 5000 men had staged a ‘violent’ demonstration in front of camp headquarters and presented a list of demands to the commandant. Gibbon and Defence Minister James Allen endured a stormy confrontation with the men’s delegates. In the face of mass protest, Gibbon and Allen gave in to some of the soldiers’ demands around demobilisation. By December, the recruits were marching out of Featherston at the rapid rate of 500 a day. Wartime regulations were extended into peacetime. The power to deport undesirables was legislated in 1919. Distributing revolutionary books or pamphlets remained seditious. And now that soldiers trained in killing had returned to their jobs and their pay disputes, firearm acts were passed allowing the state to clamp down on whole working-class neighbourhoods. Fear of working-class resistance strengthened the apparatus of state surveillance. Meetings of radicals were secretly attended by police and fortnightly reports were sent to Police Headquarters. Detectives in each district systemised this work by compiling an index of individuals who had ‘extreme revolutionary socialistic or IWW ideas’. This signaled the formation of New Zealand’s first ‘Special’ Branch and laid the groundwork for all future spy agencies in New Zealand. The unrest unleashed in the final months of the war directly influenced the monitoring of dissent in New Zealand for years to come. This is a small taste of the untold history of armistice and the end of the First World War. Instead of learning about it, the turbulent events leading up to and after armistice are turned into joyous celebration. Cloaked in the language of peace, Armistice Day becomes an official exercise in justifying the insane loss of life. We might even be tempted to see Armistice 100 as an example of what Pulitzer Prize-winning novelist and scholar Viet Thanh Nguyen calls the ‘industrialisation of memory’. In his book Nothing Ever Dies: Vietnam and the Memory of War, Nguyen also examines the ‘memory industry’ – the museums we take our children to visit, the sculptured grounds of Pukeahu National War Memorial, the Armistice Day parades at sunset. For Nguyen, at the root of this industry is the industrialisation of memory. Industrialising memory proceeds in parallel with how warfare is industrialised as part and parcel of capitalist society, where the actual firepower exercised in a war is matched by the firepower of memory that defines and refines that war’s identity. In other words, memory and the memory industry are weaponised. And while the memory industry produces kitsch, sentimentality, and spectacle, the industrialisation of memory ‘exploits memory as a strategic resource’. It is how bodies are produced for current and future wars. People across the country will take part in a number of sanitised official events, from joining the ‘roaring chorus’ to texting the Armistice Beacon. They’re unlikely to learn much about the strikes, mutinies and resistance from below that toppled both generals and governments. Thanks for posting this Jared. The first couple of links seems to a page that says: 'Proxy Error'. It looks like the 1914 -1918 encyclopedia website has crashed. Hopefully because so many people are reading up about mutiny and revolution!